Tonight we took pizza to a new level, we grilled it, this is more my style. Nothing gives pizza the flavor and texture of a hot wood fire and the closest I can get here in our condo complex is pizza on the grill with hickory cooking chunks. That is just what I did. Because we were out of pizza sauce and pepperoni we had to improvise and ended up making a pizza with chicken, spinach, basil and olive oil. We then finished it with a balsamic reduction my wife whipped up. It was light and most tasty. 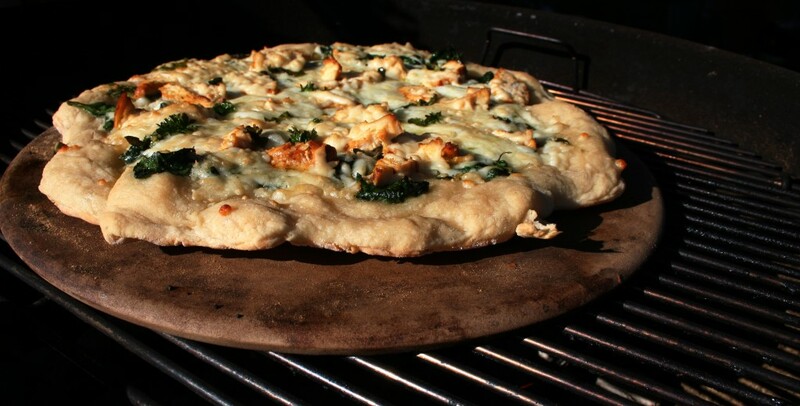 The wood smoke flavored the cheese and crust nicely, it complimented the strong flavors of the basil and the dry heat and free flowing air from the grill gave the pizza a nice crispy crust . So here is how I did it, I cheated, I first pre-heated the stone in the oven at 500°F for about an hour. While I did this I got the grill ready with half charcoal – half hickory chunks; spreading the coals evenly around the charcoal grate. I then cooked up a chicken breast, I had marinaded the chicken over night in a combination of 3 tablespoons of olive oil, a clove of pressed garlic and a teaspoon of paprika. My wife wilted spinach and fresh basil leaves from our patio with some olive oil and pressed garlic. Once the chicken was cooked up, I sliced it up, rolled out the dough onto my pre-heated pizza stone. 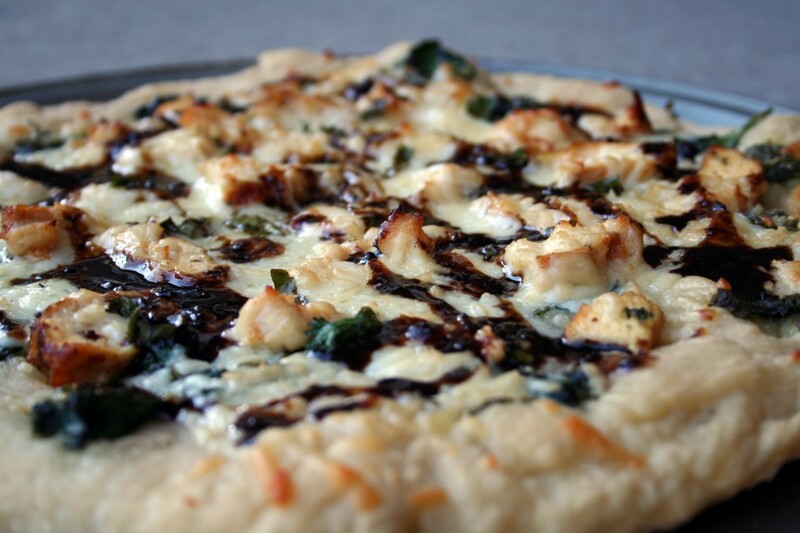 I then brushed the crust with olive oil, topped with the spinach-basil mix and cheese. Then it was onto the grill for about 15 minutes. At this point the charcoal had passed its prime so it took more time than I would have liked, but it was worth it. So in the end we had two verdicts, I thought the grilled dough was much better than that baked in the oven. My wife however would rather have the crust baked in the oven. So what was the difference? The pizza from the grill had a nice, crispy and slightly burnt crust. Burnt in this case is not a bad thing, it was just lightly charred in the center on the bottom. The pizza from the oven was much more moist and the crust was not nearly as crispy. The crust from the oven also lacked the flavor the grilled pizza got from being exposed to the fire and smoke of burning wood. If it was up to me we would be done eating pizza from the oven and keep the heat outside, and get a better flavored crispier crust from the grill.